Prashanthi 90th Birthday Celebrations a total flop! The 300 crore of rupees announced by Puttaparthi AP politician Palle Raghunatha Reddy for the Prashanthi 90th birthday anniversary were supposed to bring in half a million devotees, whereof 10% foreigners (50,000) – according to Express News Service november 19. From the photo below I originally estimated 20,000 attendees. Since then a Tamil YouTube video has emerged showing considerably more people in the Hillview Stadium, but still far less than the predicted half a million (the total stadium capacity is absolute maximum 300,000 and it was far from being full). There seems to be less than 100,000 altogether. The number of foreigners visible in videos is almost none, and this event involved a free meal and handouts, therefore attracting villagers from the area for one day. Not much return for the expenditure of over US $48 million of public taxpayers money (if the Indian Express report on that sum was accurate). The propagandist saibabaofindia. c om web site had no photos of the event to show (unless very well hidden)- only the same old mishmash of photos of Sai Baba on former birthdays but not the ones where he was a zombie-like a stone figure (drugged), aroused only to break into tears! The propaganda machine at Prashanthi Nilayam has always been in overdrive and exaggeration of its successes is rife, especially the number of visitors, devotees and organisation members are always inflated beyond recognition )when compared with reliable source materials. For example, on the 70th birthday Sathya Sai Baba had predicted that there would be 3 to 4 million visitors, according to what V.K.Narasimhan told me beforehand. The ashram engineer, Mr. Ashoka, told a Norwegian engineer (Mr. Terje Nedland, who I knew well and who was planning an ashram water project) that he calculated that, at any one time, the entire accommodation facilities of the ashram and Puttaparthi in (1995) were less than 50,000 persons. About 250,000 maximum can occupy the Hillview Stadium., where the entire crowd was present at the main ceremony. The ashram was as empty. Even when largish areas with tents and outside camps are accounted for, the figure of 500,000 persons is reckoned to be much greater than had been present in the area on the Birthday. 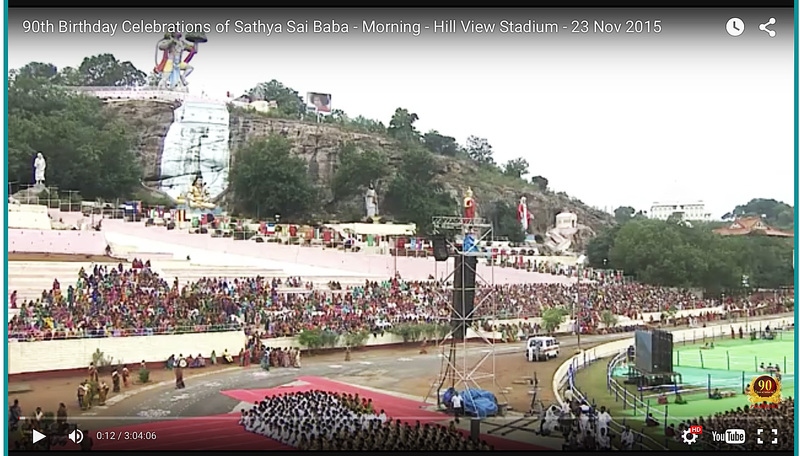 A former American friend, Robert Bruce, who I had known for years, was told by Sai Baba in a brief interview after the celebrations that there had been 3 million persons present! Others reported similar statements by Sai Baba. (Some, unable to make his figures add up, argued that – “since Swami is never wrong” – this perhaps was intended to include disembodied souls visiting God! The basis for this was Sai Baba’s own statement to that effect at a previous large celebration). When I asked VKN for clarigfication, he replied, “Swami always multiplies these numbers by ten.” He was well placed to know, if anyone was! In the preceeding year to the 1995 birthday bonanza, Sai Baba had told one interview group that there would be 7,000 Japanese there, but in fact the registered number was 75! A group from New Zealand led by Mr. Arthur Hillcoat were informed by Sai Baba that he wanted 5,000 service workers (Seva Dals) from their country present in 1996 at the Birthday. But at the 70th birthday, the biggest foreign contingent, however, came from the USA – 750 persons in all. This entry was posted on December 1, 2015 at 7:59 pm	and is filed under Sathya Sai Baba. Tagged: Bhagavan Baba 90th birthday, Prashanthi 90th birthday anniversary. You can follow any responses to this entry through the RSS 2.0 feed. You can leave a response, or trackback from your own site.